The Persistence of Vision Ray-Tracer was developed from DKBTrace 2.12 (written by David K. Buck and Aaron A. Collins) by a bunch of people (called the POV-Team) in their spare time. It is a high-quality, totally free tool for creating stunning three-dimensional graphics. It is available in official versions for Windows, Mac OS/Mac OS X and i86 Linux. The POV-Ray package includes detailed instructions on using the ray-tracer and creating scenes. Many stunning scenes are included with POV-Ray so you can start creating images immediately when you get the package. These scenes can be modified so you do not have to start from scratch. In addition to the pre-defined scenes, a large library of pre-defined shapes and materials is provided. You can include these shapes and materials in your own scenes by just including the library file name at the top of your scene file and by using the shape or material name in your scene. Since this is free software feel free to download this version and try it out on your own. The most significant change from the end-user point of view between versions 3.6 and 3.7 is the addition of SMP (symmetric multiprocessing) support, which, in a nutshell, allows the renderer to run on as many CPU’s as you have installed on your computer. This will be particularly useful for those users who intend on purchasing a dual-core CPU or who already have a two (or more) processor machine. On a two-CPU system the rendering speed in some scenes almost doubles. 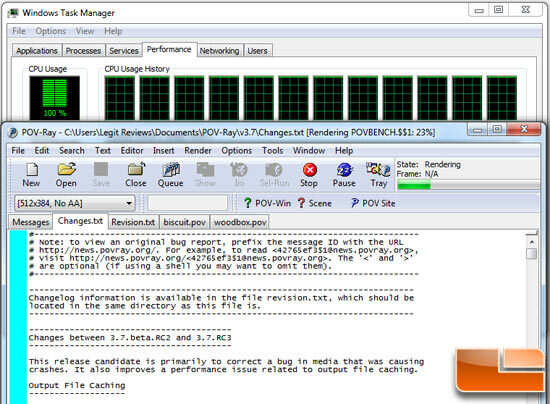 For our benchmarking we used version 3.7 RC5, which is the most recent version available. The benchmark used all available cores to their fullest extent to complete the render. Once rendering on the object we selected was completed, we took the elapsed time from the dialog box, which indicates the exact time it took for the benchmark to finish the benchmark and a score in PPS. 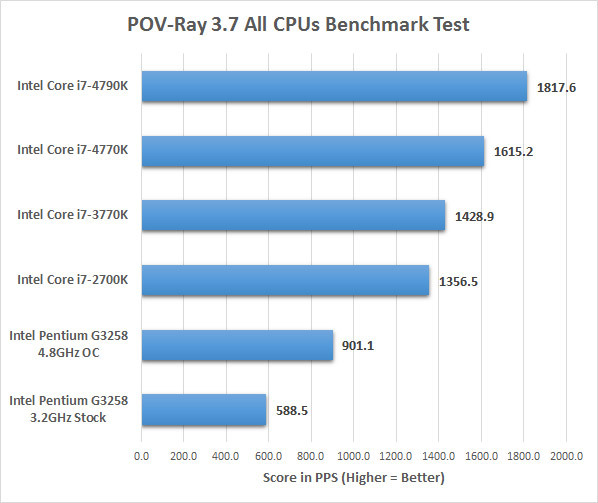 We are using the final CPU score for our benchmarks and a higher value indicates faster system performance. Benchmark Results: The Intel Core i7-4790K Devil’s Canyon processor tops the chart when it comes to the POV-Ray multi-CPU benchmark with a score of 1817.6 PPS. The Intel Pentium G3258 comes in with a score of 588.5 PPS with stock clock speeds and with the multiplier bumped up to 48 we were able to get 901.1 PPS, which is a solid 53% performance increase.